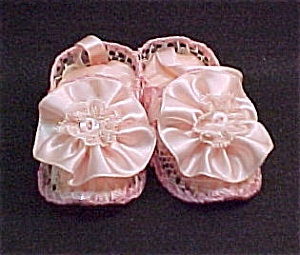 Pink Satin Baby Bootie Wall Hanging or Pin Cushion. Cute little booties made of clear white plastic with white flowers. They are pieced and crocheted together with pink crochet thread. Stuffing covered with nylon taffeta. Pink Satin ribbon florettes trimmed with ruffled pink & white lace and pink MOP buttons. They are crocheted together. Pink Satin ribbons attached for hanging. Age unknown. Clean and ready to decorate a baby girl's room or a great addition to a pin cushion collection. NOTE: This product is a collectible item not intended for use by children under age 12.